In his latest, immersive exhibition, Whatever hour you woke, Ryan Burghard alludes to memory, to the passage of time, and to the imperfect erasures of history, using the sparest of marks and materials. The title is drawn from the first line of Virginia Woolf’s A Haunted House, a short prose-poem from 1922. The house she describes is less haunted than filled with the presence of its former inhabitants. The couple is faintly glimpsed through slight shifts in the location or appearance of objects; through phenomena sensed rather than directly seen or heard; and through a quest for a treasure that turns out not be physical at all. In a similar way, Burghard’s carefully considered installation at the Pataphysical Society through July 13, envelopes you in a kind of vibrating silence. Gradually, as your mind becomes accustomed to the space, its details reveal themselves, coalescing into a series of five works that are at once discrete and interrelated, linked by their concern with presence (the gestures that created them) and absence (they function as shells of those gestures). 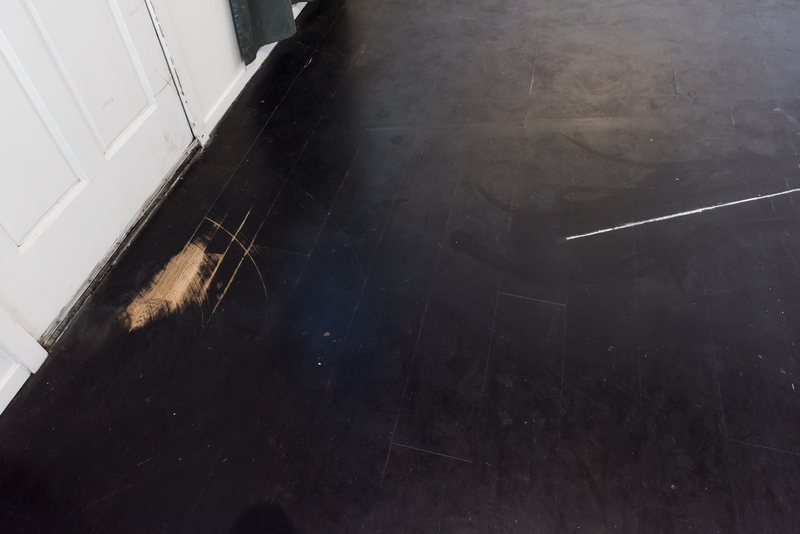 A white line on the floor ends with the stub of chalk used to make it (in the black nothing between). 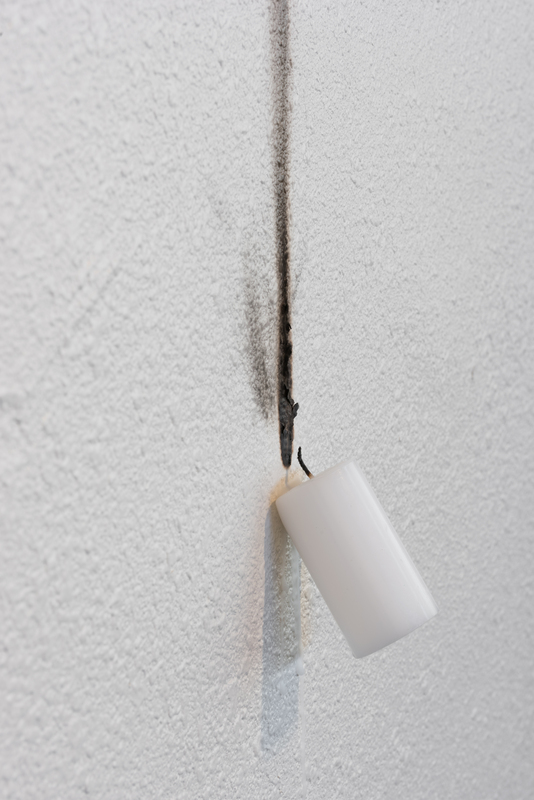 A candle stuck to the wall with its own melted wax has left a smoke smudge from its guttering wick (seeking fire). The match that started the flame rests on the floor below: the record of a brief moment of illumination traced from its beginning to its end. Facing Silence is the largest piece: an unintentional palimpsest, and a “history that got left behind,” as Burghard describes it. It is a slightly off-square section of lathe-and-plaster wall he sawed out of an old office building on Southeast Grand Avenue during its demolition. Set into the gallery’s wall, it lies perfectly flush, framed by the incision lines. One crumbling corner reveals the lathe support; two picture hooks, nail holes, and overlapping stains left by a series of frames and their backing are a mute record of the office’s past occupants, creating a layered composition in gradations of cream and beige. The remaining two works are perhaps Burghard’s most complex. The mind is its own place is, at first glance, a curiously dented Styrofoam cup resting on an oversize plinth that raises it just a few inches from the floor, so that one needs to kneel down to see it closely. It took Burghard four hours of slow, contemplative work to turn the cup inside out, a process that is a testament to patience and to the notion of testing materials and pushing them to their limit. 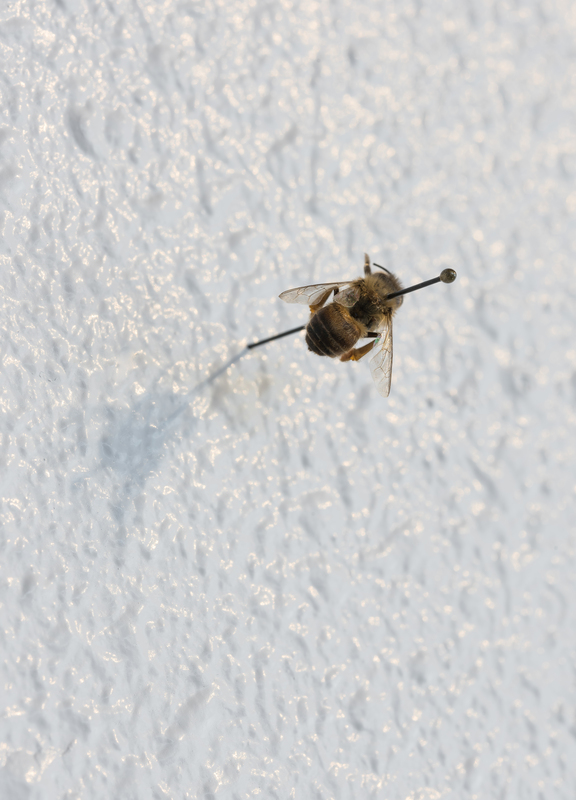 A rushed viewer might well overlook The sun will not illuminate, a honeybee mounted on a specimen pin. Yet this tiny work is the exhibition’s linchpin, embodying in its form many of the exhibition’s themes of mortality, gesture, and history. Bees are storytellers, whose learned flight patterns trace out maps for each other, indicating food sources and their distance from the hive. Bees are domestic: they build complex houses. When abandoned and emptied of their honeyed treasure, the hives are haunted by the bees’ absence: mute reminders of the activity and lives that once filled them.